with Rachel Niermann, RDN, LD - Outpatient Oncology & Community Wellness Dietitian. Learn ways to benefit your body and mind through your nutrition habits, and how to eat well to age well! This program is for adults, and will take place on the library's lower level. Following the presentation, there will be time for questions & conversation with Rachel Niermann, Registered Dietitian for Blanchard Valley Health System. 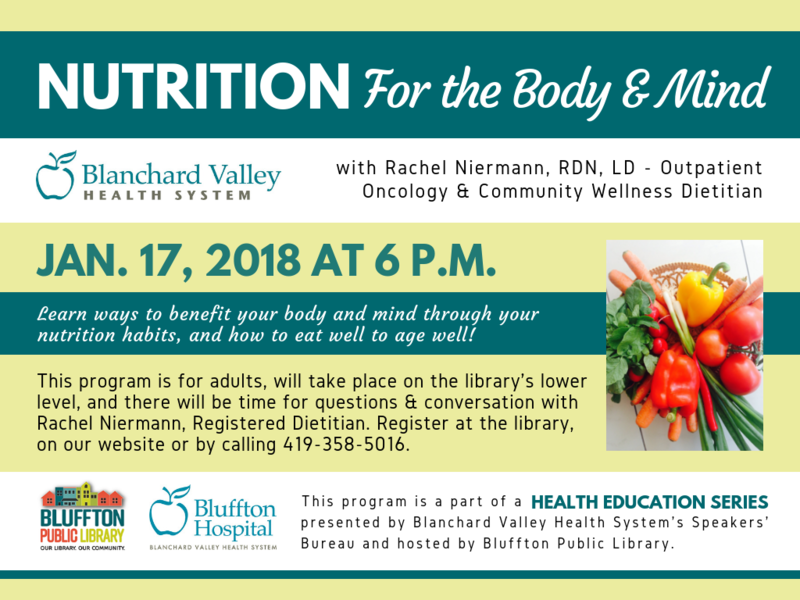 This program is a part of a Health Education Series provided by Blanchard Valley Health System's Speakers' Bureau and hosted by Bluffton Public Libary. Email psc@Blufftonpubliclibrary.org with questions.